Every employee is different, but unfortunately many leaders use a one-size-fits-all approach to leading. In doing so, these otherwise well-intentioned leaders are working harder than they should while not getting all they could out of their teams. 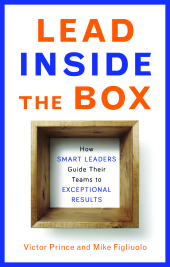 Lead Inside the Box gives leaders a way to get the best out of their teams by focusing their energy where it will make the biggest difference. A leader’s time and energy is precious. It’s a finite resource and must be invested wisely. The better you’re able to determine where you’re investing that time and energy, the more effectively you can lead your team. Through simple frameworks brought to life with stories from the trenches, leaders will be able to see their own teams–and themselves–from a new perspective. Paradoxically these methods will enable leaders to improve their team’s performance exponentially while expending half the effort. By understanding the behaviors your team members will demonstrate and how you invest (or don’t invest) your time and effort into them, you’ll get a clearer picture of the 8 archetypical behaviors that can show up in the box. With that understanding, you can begin leading differently which will improve your performance. So what are you waiting for? Get your copy of the book now and lead your team both more efficiently and more effectively. When you’re done with it, let us know what you think!